In February, I’ll knock out the first state of 2015 in my quest to race in all 50 states for my sister Taylor and the fight against Batten disease. Originally I’d planned on taking January off, but it’s been two months since Charlotte’s Thunder Road Half Marathon, and I’m antsy. So on a whim I signed up for The Village 10K in Waxhaw, right outside of Charlotte, on January 31. We’re approaching the first anniversary of the 2013 Thunder Road Half Marathon, where the story of Taylor’s courage on the race course and in her fight against Batten disease captured the attention of people across the nation. The moment I crossed the finish line of that race blindfolded, I knew the magic of that day could never be repeated. But I can’t stop running for Taylor, and I’m on a new mission now – a mission to run a race for her in all 50 states to spread this story far and wide. I’ve run around the rim of Oregon’s Crater Lake, where she and my parents found solace during her time in a historic clinical trial in Portland; I’ve run through Tennessee’s Great Smoky Mountains, just a stone’s throw from the village of Blowing Rock where we made a lot of happy memories together and my sister made the best “senior” flower girl ever on my wedding day; I’ve run in Taylor’s purple witch costume in a Great Pumpkin race in South Carolina to commemorate Halloween, her favorite holiday when she could still trick-or-treat. In the next 10 months, I’ll take Taylor’s story from North Dakota’s Red River Valley to Hawaii’s lush gardens. First, though, comes the 2014 edition of Charlotte’s Thunder Road Half Marathon, where I’ll run 13.1 miles for my little sister as she recovers from her second surgery in a difficult year. About the time I reach the four-mile mark of the half marathon, at 8:15 a.m., approximately 30 parents and teens affiliated with an organization called Playing for Others will begin the Thunder Road 5K. The parents will be blindfolded; the teens will be their guides. In completing the 5K blindfolded, they’re honoring Taylor’s story and the fight for a better future for millions of people like her. I wish I could run my race AND be there to see Playing for Others finish the 5K. But my experience training to become a blind runner and my relationship with my blind sister have taught me that some of the most beautiful things in this world do not have to be seen to be felt. 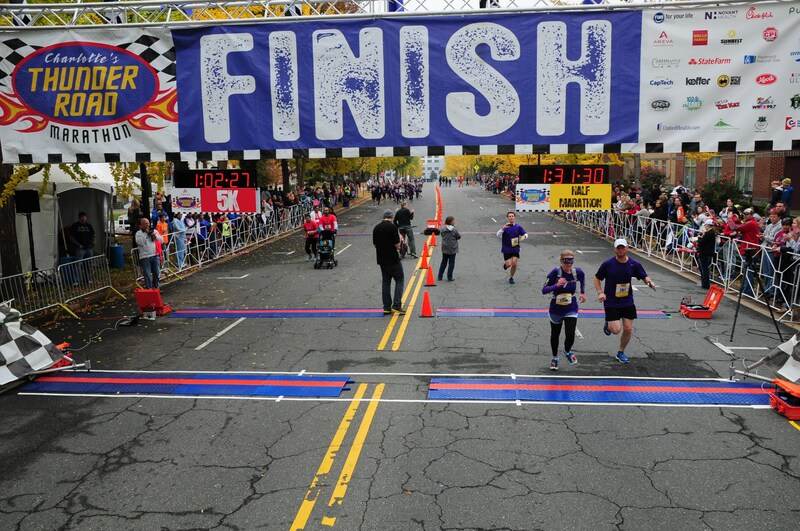 Running Charlotte’s Thunder Road Half Marathon blindfolded last year was a surreal experience. With the help of my guide, Andrew, and countless other supporters, we accomplished every goal we set out to achieve. The story didn’t end when we crossed the finish line, and while I’ll run Thunder Road sighted this year as a quick detour from my quest to race for Taylor in all 50 states, a group of teens especially close to my heart has something incredible planned for Charlotte’s largest road race. Playing for Others is a teen organization focused on personal development, service and the arts. Taylor’s Tale was one of its chosen charities last year, and Taylor participated in its buddy program. 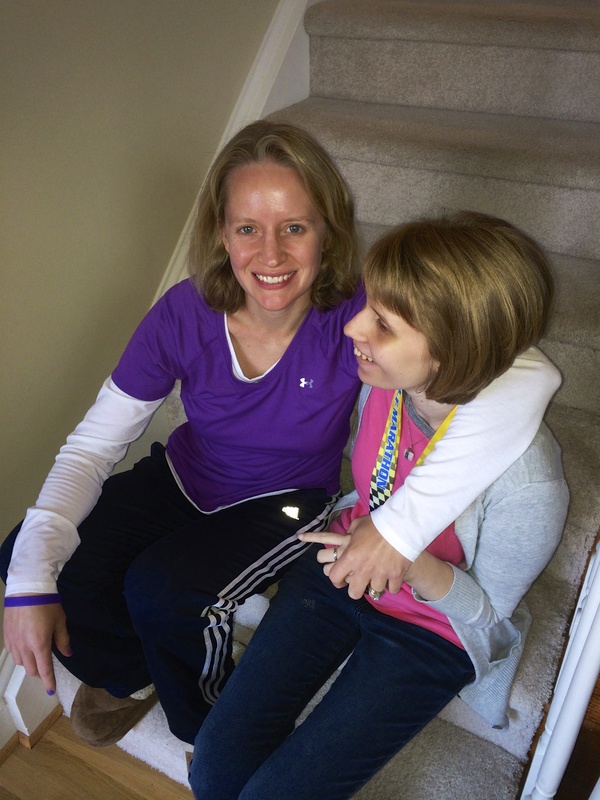 Her “buddy,” Nicole, now a freshman in college, is a friend for life. If you went to Thunder Road last year or saw any of the photos or many news stories on our effort, you may remember these amazing kids. About 70 of them wore purple tutus, sparkle and glitter. They wielded signs and pompoms and packed into our official cheer station at the race’s final turn. When we passed the station, all 70 of them took off after us in an unscripted, spontaneous, gorgeous burst of emotion. And when I took off the blindfold after crossing the finish line and hugged my mom, they surrounded us – and didn’t leave. It was like the end of a Disney movie, and I half expected them to carry us out on their shoulders. It was beautiful and exciting and not cheesy at all. Playing for Others is supporting a new cast of deserving charities this year, and Taylor is no longer in the buddy program. Many of the kids in that crowd on race day graduated and went off to college. But Playing for Others hasn’t forgotten about Taylor’s Tale, and they’re creating their own version of the blindfolded run at this year’s Thunder Road 5K. What do the kids have in store for this year’s race? Teens have signed up to run/walk the 5K tethered to parents. The teens will be sighted; the parents will be blindfolded. Anyone not running will paint the sidelines purple with specially created t-shirts and encourage runners with their tireless spirit. I went to the group’s first practice this past Sunday. Some of the kids and their parents are runners; some of them have never run a race. But that’s not what’s important. I remember well how Taylor was not a “runner” when she signed up for Girls on the Run in the fall of 2008. 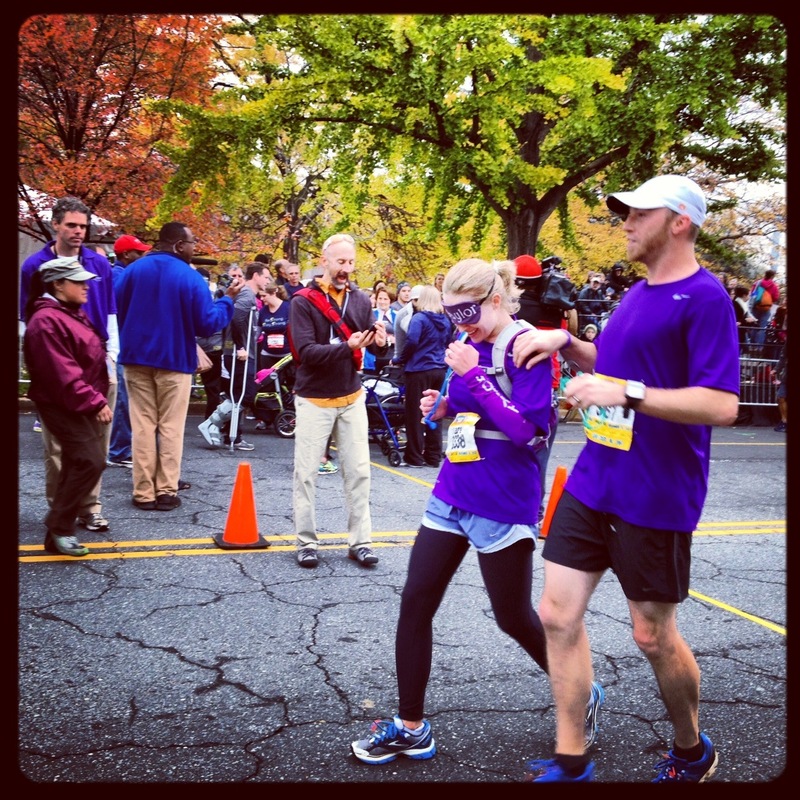 Yet she overcame blindness and the effects of Batten disease to run not one, but two 5Ks tethered to a guide. This is not about physical gifts – it’s about sheer will. And Taylor always had that in spades. Please be on the lookout for these amazing ambassadors for Taylor’s Tale at Thunder Road on Saturday, November 15. Thank them for their amazing dedication to people like Taylor and for taking on such a remarkable personal challenge. I understand what it’s like to learn to run blind – I’ve been there. But I believe they’ve got what it takes. On another note, if you’re planning to run the Thunder Road 5K, half marathon or full marathon, please consider running for our Taylor’s Tale team. Simply select “Taylor’s Tale” as your team when you register on the race website and wear purple on race day. Let’s paint Thunder Road purple again for the fight against rare diseases! 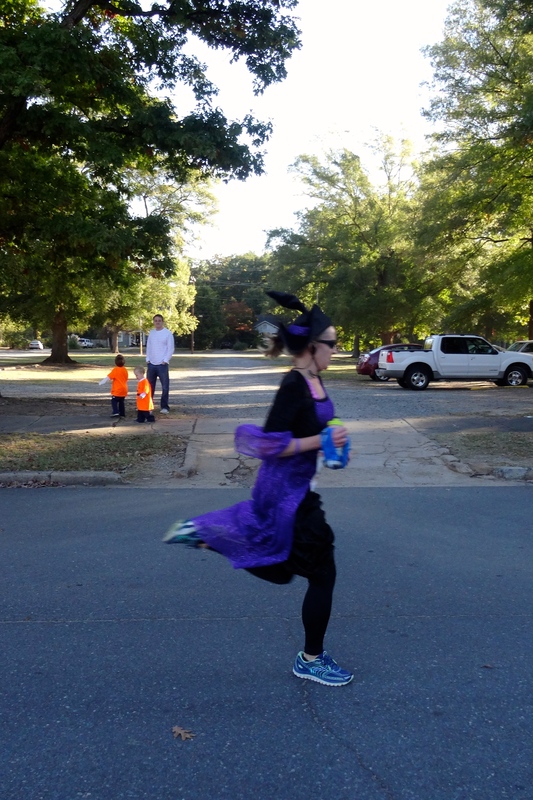 I don’t run many 5Ks, but I signed up for the Great Pumpkin 5K Race, a small event hosted by the Rock Hill Striders just inside the South Carolina border, because I want, almost more than anything where running is concerned, to see my sister at the finish line of a race. Taylor hasn’t been able to come to one of my runs since I logged 13.1 miles on a quarter-mile loop around the town green in Davidson, North Carolina for a Batten Disease Support & Research Association fundraiser in June 2012. But Rock Hill is 20 minutes from my parents’ house, and the race starts later than most, so we’ve got a shot. 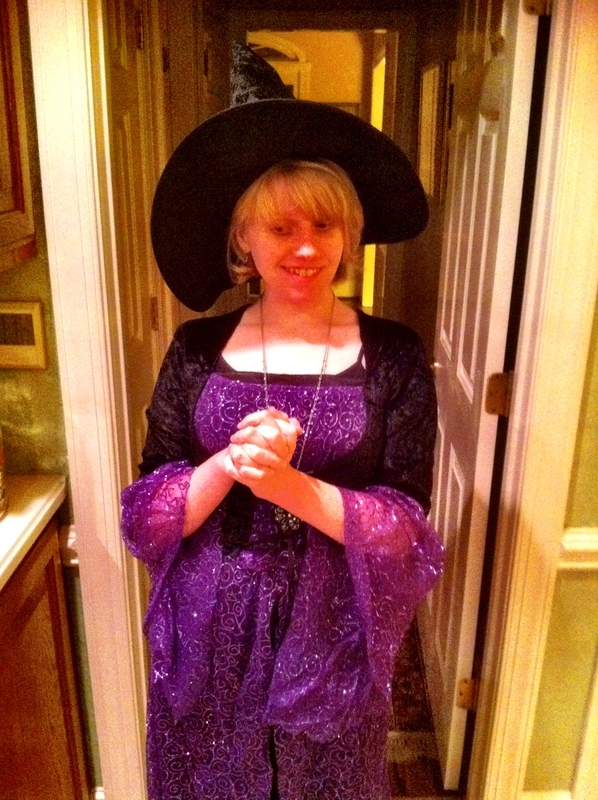 I’ll wear a purple Halloween costume that captures the spirit of Taylor for the Great Pumpkin 5K. Have ideas? Let me know in the comments! Want to run with me? Sign up here! I’m not running Thunder Road blindfolded this year, but I’ve been signed up for the half marathon since registration opened in January. 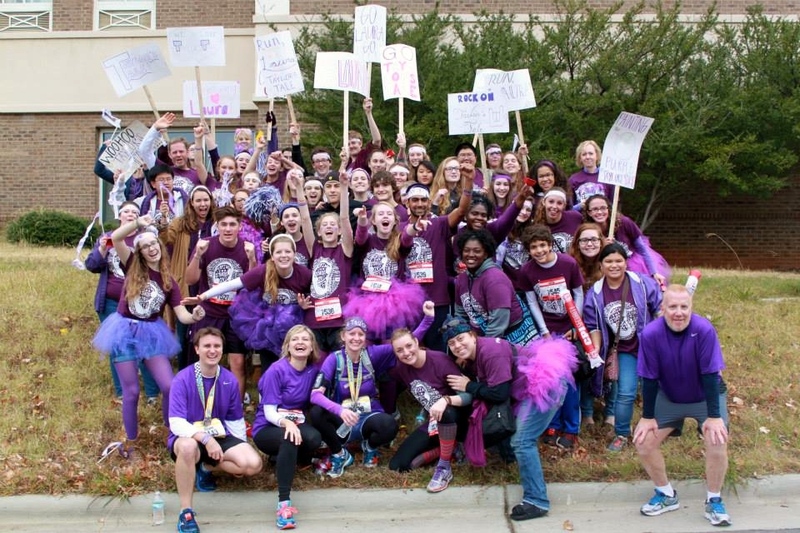 Playing for Others, the wonderful teen organization that made our cheer station come alive at the 2013 race, is supporting us again this fall. They have something new up their sleeves; I’ll be sharing their plan in a future post, but for now, you’re invited to join us by registering to run the 5K, half marathon or full marathon for the Taylor’s Tale team. Sign up here! On Saturday, Dec. 13, the Charlotte Running Club will attempt to break the world record for most runners tied together while completing a 5K race. The current record stands at 116 runners, and the club hopes to have at least 200 runners. After running Thunder Road blindfolded and tethered to my good friend Andrew Swistak last year, I couldn’t resist signing up to be part of this cool event. You can still join us! You don’t have to be a Charlotte Running Club member, and there’s no cost to participate on the team, though you have to register for the race. For the $20 registration fee, you’ll get two t-shirts (race t-shirt and Guinness World Record attempt t-shirt) if you register by Nov. 8. Send an email to run.charlotte@gmail.com if you’re interested in being on the team. Do this before you register! I’ve already registered for five races in 2015 including events in four states outside my home state of North Carolina. Taylor’s courage inspires me to run farther and work harder in all that I do. I can’t wait to share more of this journey with you! Want to stay up to date on my quest to run in all 50 states for the fight against Batten and other rare diseases? If you haven’t already, subscribe to the blog to get updates. Thanks for your support!